The Bugo is a safe, cost efficient, easy to use, effective floor application that protects people from bed bugs. Safe & Easy to Apply Lasts up to 8 weeks Visually Discreet The Bugo is a simple to use device which sticks to the floor around the bottom of the bed leg. It is virtually invisible, discreet to view and acts as a barrier and detector to stop bed bugs from getting into your bed and informing you of any issue of insect infection. An innovation in bed bug and insect bite prevention. The Bugo is a safe and simple to use device that lasts up to 8 weeks, is virtually invisible and acts as a barrier against bed bugs and as a detector to infestations – allowing you to protect you, your family and guests against these critters. 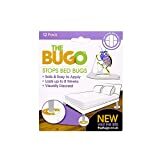 Just stick The Bugo on the floor around the bottom of the bed legs to prevent these unwanted crawling insects from getting to you, your mattress and sheets, or in any other crook and cranny’s in your bed. Bed bugs live in homes, hotels, cinemas, caravans and offices. They are great hitchhikers and are well known to travel back in suitcases or clothes. The Bugo is designed to be used in any location, so use The Bugo home and away to detect or stop the spread of bed bugs. Choose the right floor application when ordering: – Hard floor application for wood, slate, tile etc. – Soft floor application for carpets, rugs etc.